Colombia is a fantastic and beautiful country, and Colombians are just about the nicest people on the planet. Although a surprising number of Colombians have actually heard of Celiac disease (referred to as some strange disorder where you can't eat gluten), there definitely seems to be a lack of awareness about what foods can and actually do contain gluten (besides the obvious, i.e. bread). I'm sure most celiacs that have visited Colombia would agree it can be pretty challenging to get truly gluten-free foods in restaurants, and in common grocery stores without knowing a few things first. You may get servers and chefs wanting and willing to help you, but they may just be unknowingly slipping you gluten-contaminated ingredients. The best and most dangerous example I can think of is Colombia's most commonly used spice, cumin (in Spanish “comino”). Typical brands of cumin spice that one can find in the grocery store actually contain wheat – this is not always labelled. Some chefs may use real fresh cumin but this is rare, and you probably won't get a reliable response if you ask... Be aware this spice is used on almost every meat, even if you ask them to put no spices on – I've personally witnessed it myself, watching cooks ignorantly contaminating dishes even after being instructed not to. I then spoke to them and the manager (somewhat angrily) and they apologized stating they didn't realize that even a tiny amount was harmful. 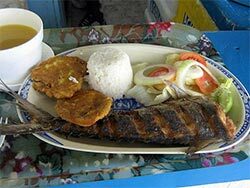 I own and operate a Colombian ecotourism company that specializes in all-inclusive adventure tours with special meals plans (gluten-free, vegan, vegetarian, allergy), so we know all about how to prepare for travelling with special food needs in Colombia. For example, to prepare for our gluten-free meal plans we actually buy corn directly from the farmers, cook and grind it ourselves, so that our gluten-intolerant clients can enjoy healthy delicious arepas. You can also buy raw corn from markets called "galerias" and process it yourself, but know that this takes time and you will need a grinder (available in major grocery stores). The upside of all this is that you get to actually learn much more about the local food culture. For our tours we also buy our spices fresh, and we wash and dry them ourselves to make sure they are not contaminated. This is easy and cheap, and you can buy fresh spices in local grocery stores as well. For our tours we hire our own cooking staff, book cooking facilities, and bring our own equipment to prevent cross-contamination, as we travel from place to place. So finding accommodations with kitchens is possible, but if you are looking at more budget accommodations beware of the lack of adequate cooking utensils, pots, pans, etc., therfore you may want to bring your own. If you do get in a tight spot, the grocery store EXITO (found everywhere in Colombia) will have everything you may need to equip your travel kitchen. If you are planning to travel to Colombia, having a card that explains your situation in Spanish is important, but know that it will only help you to explain your situation culturally but will not help much in restaurants. I have travelled all across Colombia extensively, and with my food allergies and I was only able to find just one restaurant (out of hundreds) that did not make me sick (located in Cartagena – the Australian Fusion Cafe, if you go, tell chef Ian that Vivian from Colombia World says hi - he is a fantastic guy with fantastic knowledge of local food and food prep). Even though the info-card won't help you much with eating in restaurants, it's still a good idea to bring it along to help educate new friends and people you meet. Also, local restaurants will become more and more aware of special dietary needs, hopefully being able to accommodate them better in the future. So if you want to do it on your own, plan to cook. Remember that food labels here cannot always be trusted, and it is common practice to put wheat in processed meats like sausages. Therefore, I would certainly avoid any processed foods. Stick to fresh meats (that have not been prepackaged and injected with mysterious sauces including soy), and fresh veggies, and fruits (there are tons). Beans, rice, potatoes, yuca, yams, are also good sources of starchy carbs (beans take forever to cook though, as you should avoid canned varieties). Importantly, if you do want to find gluten free grains like quinoa, you won't find them in major grocery stores. Ask for health food stores (really small weird looking shops, there are nice bigger ones sometimes in bigger cities) – they are called “tiendas naturistas”. Finally, you may have to stick to pricier wine options because there is no gf beer in Colombia... but if you do find one email me! !